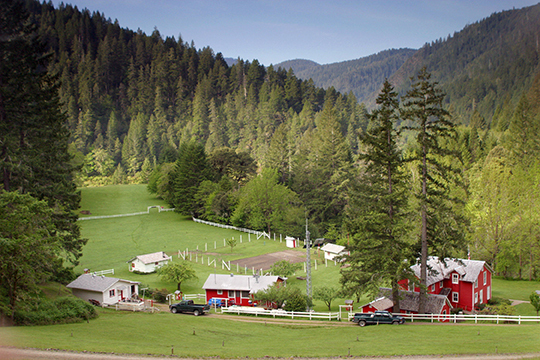 Photo: Rogue River Ranch, ca. 1903-1930s, pioneer ranch, near the confluence of Mule Creek and the Rogue River, Agness, Curry County, OR. Photographed by John Craig, U.S. Department of Transportation, n.d., [cc-by-1.0 (creativecommons.org/publicdomain/zero/1.0/deed.en)], via Wikimedia Commons, accessed January, 2014. Curry County administrative offices are located at 94235 Moore Street, Gold Beach, OR 97444; phone: 541-247-3296. Curry County is named for George Law Curry [1820-1878]. Curry served as the last Territorial Governor prior to Oregon's becoming a State in 1859.